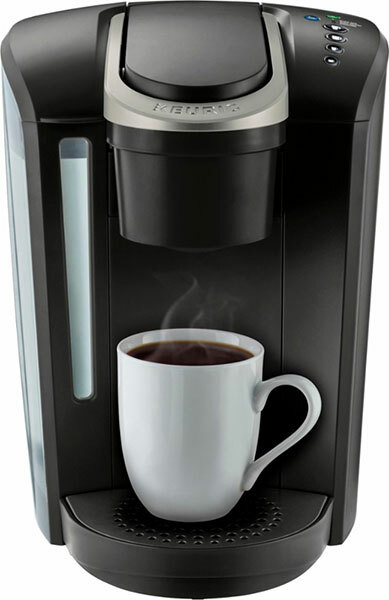 A review of Keurig K-Select single cup brewer, the latest classic series Keurig model. Keurig K-Select lets you brew all regular k-cups and your own coffee, at the touch of a button. The K-Select (K80) keeps many of the same features classic series models have: Quiet Brew Technology, removable drip tray, programmable auto off and removable water tank. The machine is 12.5” tall and 9.2” wide and brings a classic Keurig design. The water tank has a 52-ounce capacity, enough for brewing 5 standard cups before it needs to be refilled. Buttons are placed on top for easy coffee controls. Besides standard 6,8 and 10 ounce cup size, there’s also a 12 ounce cup setting and a Strong Brew option. The Strong Brew button increases coffee’s strength and can be combined with all cup sizes. Brewing your morning cup with K-Select is simple. To make the coffee, lift the handle, insert one k-cup of your choice, close and choose your cup size. If you want to use the Strong Brew option, first press the strong brew button and then press the desired cup size. On average, it needs 60 seconds to brew 8-ounce cup of coffee and needs about 60 seconds to reheat the water for the next cup. The auto-off automatically turns off your brewer 2 hours after the last brew and can be disabled if you don’t need this option. Keurig K-Select works with all types of k-cups: Keurig branded and non-branded, k-cups with updated or old labels. This is a classic model and it does not have a scanner. This model is also compatible My k-cup reusable filter and allows you to use ground coffee. The K-Select doesn’t work with k-mugs, k-carafe pods, Vue cups, Verismo pods, Nespresso or the CBTL pods. But, you can make all kinds of coffee drinks with k-cups so that’s not really a problem. Here are some Keurig recipes for you to try. The K-Select includes a limited one-year warranty for normal home use. Customer service help is available 7 days a week at 866-901-2739. It’s recommended to clean the external parts or the brewer regularly using a wet cloth and descaling your machine every three to six months. Here’s how to clean Keurig K-Select properly. 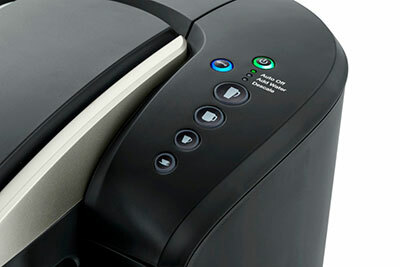 Keurig recommends using bottled or filtered water in their coffee makers or you can install a Keurig water filter. For detailed instructions on how to use or setup your brewer, see K-Select Manual. The K-Select has all the basic options you might need: works with all k-cups and allows you to use your own coffee too. The design is pretty good as well and will fit any kitchen. It’s a good choice if you want a classic series brewer and it’s much easier to recommend than 2.0 Keurig system. The machine is available in black, red, white and blue, and retails for $129.99. how do you disable the auto-off ? Hi Denise, to disable the Auto Off feature, power the brewer off while it is plugged in then press and hold the Strong and the 10oz. large mug buttons for 3 seconds – the green auto off light will turn off. Next, power the brewer on and the green auto off light should no longer be illuminated. I received an the new 80 for a replacement of the older version I had. I am surprised that this one make a lot of noise when brewing as compares to the older version. Especially at the end of the brew cycle. I am very disappointed with my coffee maker. I think your product is not worth the money. My machine never worked right from day one. I have to press the button more than once to get a full cup of coffe. I’m very disappointed. I am sorry that you’re having issues with your machine JoAnn. The coffeestylish.com is a personal blog and we’re not endorsed or sponsored by Keurig. Please call Keurig Customer Service at 866-901-2739 so their Customer service can assist you and help you troubleshoot your machine. Thank you for stopping by and for your feedback. Thanks for this thorough review, it seems like a very effective and easy to use machine. It is great that it has the benefit of a K-cup reusable filter as well. Do you think the size of the water tank is a drawback or is it easy to re-fill? It is nice that Keurig allows for a variety of beverages to be used with the machine as well, from coffee pods to hot chocolate or even tea. Thank you, Madison! Yes, the water reservoir is removable and easy to refill.